"An inn!" she blurted aloud. Just what she needed. She hadn't been in this world long enough to learn the local customs and taboos, or even what it was called, yet somehow her tracking senses had taken her right where she needed to be. Or maybe it was the aroma of roasting venison wafting on the breeze. Her mouth watered and her belly growled and she quickened her pace up the path. As she approached, she heard normal, civilized activity coming from within: a woman calling out orders, the clattering of utensils, humming and bustling. Figuring this was no den of thieves, she relaxed her grip on the sgian dubh and crossed the threshold. Leaning lightly on the door jamb, she cleared her parched throat and croaked what she hoped was a friendly "hello" in Common to the woman sitting at the end of the bar. She broke off and glanced down at her hand, which she noticed was still clutching her sgian dubh. She quickly sheathed the blade and started again. 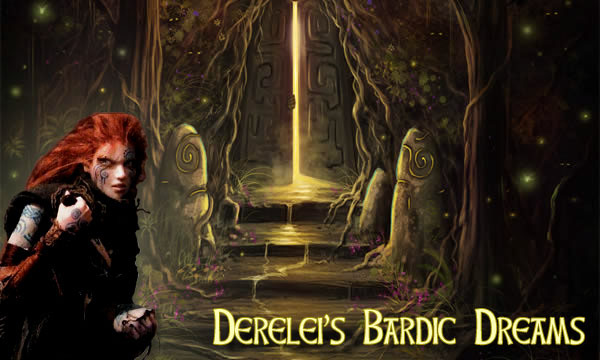 "My name is Derelei and I'm a travelling bard and stranger to these parts. I will gladly pay you, er, somehow, for a hot meal to fill my belly, a drink to slake my thirst, and lodgings." She flashed a reserved smile, hoping it was customary here to show your teeth in friendship. Then another aroma overwhelmed her senses, one she hadn't smelled in a Caledonian forest cat's age.